As the official home to Seinfeld, Zabars, Strawberry Fields, the American Museum of Natural History, Central and Riverside parks, Lincoln Center, and endless restaurants and bars—Manhattan’s Upper West Side is culturally well-fed. But the popular, populated neighborhood is still starving for residential living space. One might have better luck hailing a taxi during a rush hour deluge than locating new residential construction here. Enter developer Miki Naftali and Danish architect Thomas Juul-Hansen, whose 210 West 77th Street project will nourish the Upper West Side community with 18-stories of luxury apartments, slated for occupancy in early 2016. West-siders who are already salivating better prepare to pony up some dough, as apartment prices will reportedly range from $4.85 million to over $21 million. Inspired by Danish modernism, the 210 West 77th Street building resembles an edifice you’d bicycle past in Copenhagen rather than New York City (and that’s a good thing). Juul-Hansen’s building design features hand-formed Danish brick, Juliet balcony façades, and oversized mahogany windows that are harmonious with the Upper West Side’s architectural character. Not since Danish immigrant Jonas Bronck (for which The Bronx is named) has a Dane given New York City so much in a time of need. 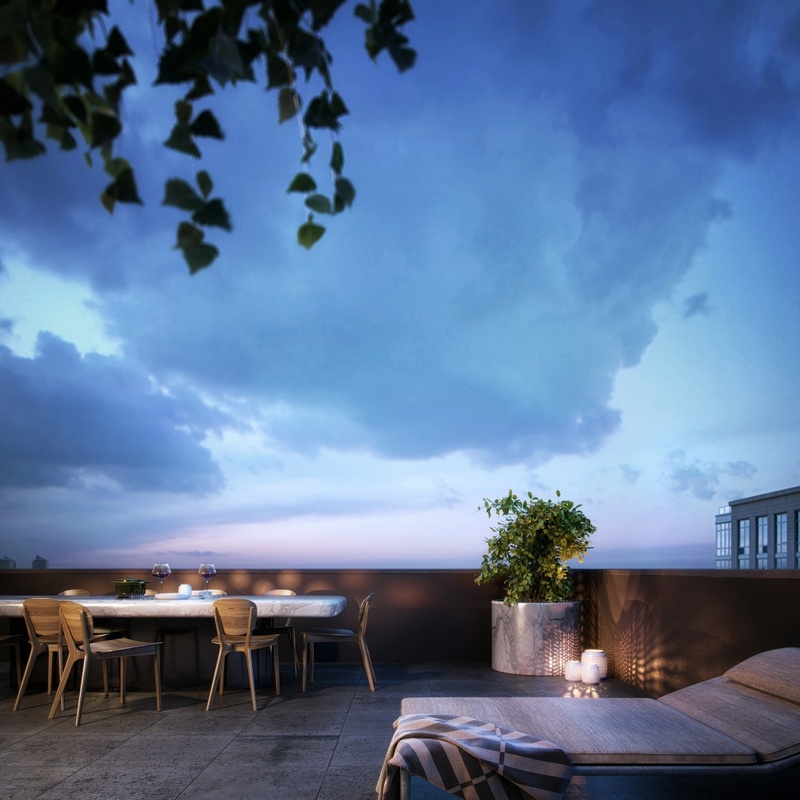 The 77th Street residences are half- and full-floor units ranging from 2,058-square-feet for three-bedrooms, to a 5,973-square-foot duplex penthouse with outdoor space. Select residences offer fireplaces and outdoor terraces. All units offer private access via an elevator that transports directly to the apartments. Master bathrooms offer Grigio Piove marble, custom wenge wood vanities and Waterworks bathtubs. Meanwhile the powder room showcases beautiful polished Marron Imperial marble slabs on the floor, accent walls, and custom carved sinks. The lobby design is highlighted by a sculptural double-height glass ceiling, detailed white oak wall panels, and Omani limestone flooring. The building’s amenities include a 24-hour doorman and concierge, a roof terrace, a fitness center, bicycle storage, and perhaps (according to design renderings) select garages. The residences are close to popular eateries such as Ouest, Spiga, and Telepan, as well as a handful of gourmet markets. “210 West 77th Street presented a unique opportunity to innovate architecturally while respecting of the character and beauty of the Upper West Side historic district,” said Miki Naftali, founder, chairman, and CEO of the Naftali Group, whose portfolio includes The Seymour at 261 West 25th Street, The Landmark Park Slope, The Bergen, and 33 Beekman. The Upper West Side is an iconic neighborhood immortalized by pop culture—including the tragic assassination of John Lennon, and Seinfeld, You’ve Got Mail, Woody Allen’s Manhattan and most famously, by the Oscar-winning classic “West Side Story.” Many artists, actors, celebrities, educators, and professionals call this community home. Dominated by five-story brownstones, famous Central Park towers with ornamented façades (The Dakota, San Remo, El Dorado) and older grand buildings topped with water towers, the Upper West Side is tight on space—despite its wide sidewalks and avenues. The 210 West 77th Street development is a rare example of recent new construction. Upper West Side living space has always been a premium. During the construction of Central Park in the 1850s and 1860s, squatters moved their shacks into the Upper West Side (laying claim to any space they could find). This led to undesirable boarding houses and rowdy taverns. One hundred years later, tenements used in the filming of “West Side Story” were razed to make way for Lincoln Center for the Performing Arts. 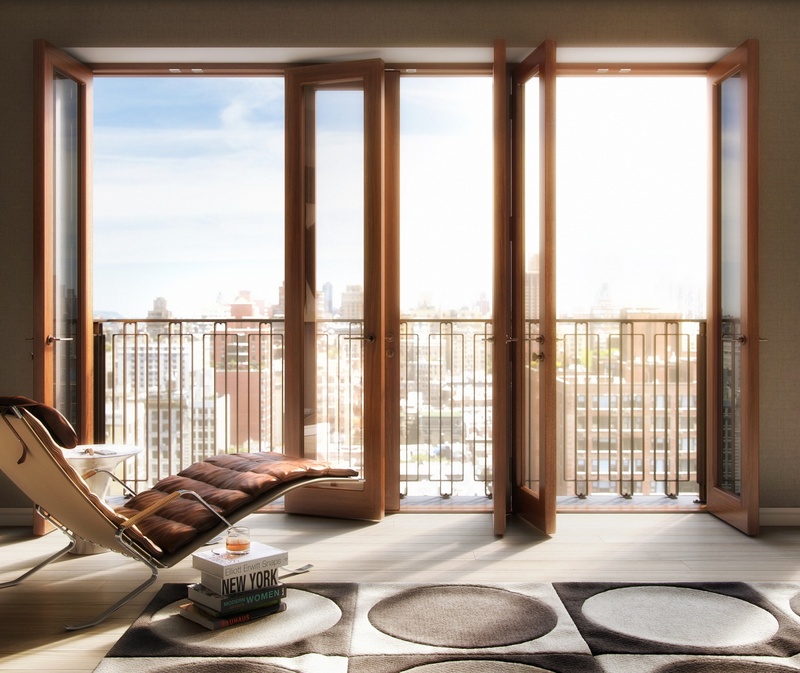 Today, the luxurious 210 West 77th building represents the latest call for urban renewal. But this modern west side story doesn’t require movie gangs or squatters to reclaim turf—just luxury space for its restless citizens.